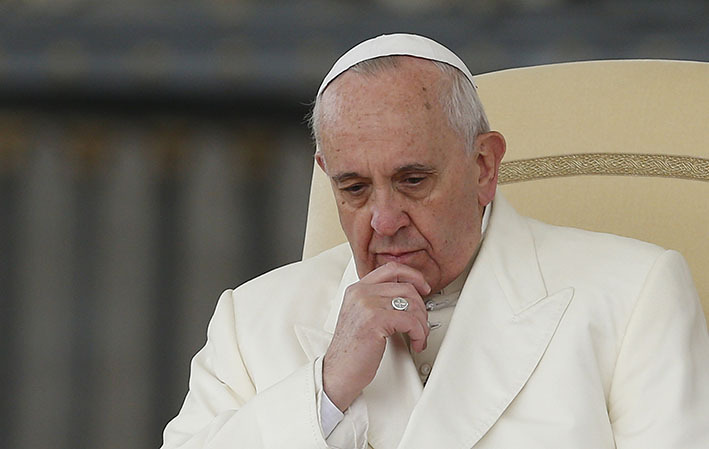 Pope says thanks: Pope Francis has thanked a 14-year-old Irish girl for her support of her mother who was sexually abused by a member of the Church when she was young. POPE Francis has sent a thank-you note to a 14-year-old girl in Ireland. The Holy Father wrote Nicole Kane, of County Carlow, Ireland, a personal letter thanking her for being “such a support” to her mother, who was sexually abused, reported the Irish Times on Wednesday. Dated July 15, displaying the papal coat of arms at the top, and stating the Vatican as the address, the Holy Father’s letter to Nicole was short and direct. Nicole’s mother Marie Kane met Pope Francis in Rome on July 7, the day he personally met at the Vatican with six survivors of sexual abuse. At that time, she told him about the abuse she suffered until age 18, and the effect its subsequent handling by the Church had on her, her husband Seán and their children Adam, 18, and Nicole, 14. During the encounter with the Pope, Ms Kane delivered a letter her daughter had written to him, expressing how Nicole was disappointed in the Church and, because of her mother’s abuse, “didn’t have any beliefs anymore”. Yet, the Irish mother still believed and hoped the Pope would bring about change, and would make the Church a safer place for children. Upon receiving the note from Pope Francis, Nicole was “so happy”, her mother said. Also, the Pope sent a letter to Ms Kane herself. “There’s a lot of hope in this house at the moment,” Ms Kane said, a hope “that he is going to change things”.